What is seen emerging is a clear path to direct fusion energy production. It appears we already have with the presently working pilot plants, a thermal solution using cold fusion, while this now appears ready to generate direct electrical current. Of course, as usual a days predicted progress inevitably takes two at least. However, this looks top be about two years out from having a working power production device. Actually draining of the power has not been fully addressed as yet and may prove trickier than thought if only because the correct device is not on the shelf. Wonderfully the theory appears to also be keeping up with experimental progress and the generation of papers suggests that the community is fully engaged in understanding and supporting this project. The skills been developed are also important because we will be going quickly to larger sizes and this technology should see abatement of the range of issues as that happens. This may be optimistic on my part, as many technologies become more difficult as size is increased. I think the reverse will be true here. Every doubling of current means 30 times power. So some relatively simple modifications which are being developed should boost power levels by 300 times. Total elimination of arcing, which they are working on now, may drop the resistance to as low as 2 mOhms. Full power, shorter electrodes, and our existing switches, FF-1 will produce over 2.3 MA, over twice our current output. New, faster switches now under design for LPP by Raytheon will get us the rest of the way to our goal of 2.8 MA. In May, 2012, the LPP plan for the next 12 months was laid out. 2) Full power output of Capacitors and to ‘Imitate’ the heavier mixture of pB11 by using Deuterium/Nitrogen. 3) Shorter Electrodes, slower run down, more fill gas. 4) New Raytheon switches for more Current from capacitors - 10x yield. 5) Switch to pB11 (incrementally higher percentage from the D/N mix) - 15x yield. Goal: 30 kJ* gross fusion energy per shot proves feasibility of a positive net power output Generator using aneutronic fuel! Since they first observed the 160 keV energies of the ions (equivalent to 1.8 billion C) over a year ago, we had been puzzled as to why they were so much higher than the 40 keV we had predicted. The first big step to the solution came May 15, with the publication online in the Journal of Fusion Energy of a paper by the Iranian team, S. Abolhasani, M. Habibi, and R. Amrollahi, “Analytical Study of Quantum Magnetic and Ion Viscous Effects on p11B Fusion in Plasma Focus Devices.” The paper studied in greater detail the quantum magnetic field effect originally applied to the DPF by Lerner, for the first time independently confirming our calculations showing that ignition and net energy gain can be achieved with pB11 (hydrogen-boron) fuel, the key to obtaining aneutronic fusion energy. But there was a second puzzle to be solved. The viscous process heats only the ions—the heavy nuclei—not the electrons. If the electrons are too cold, collisions between them and the ions would rapidly cool the ions. So what heated the electrons up hot enough so they would not cool those ions too fast? Just what is this? To start with, if the structure is solid stone or concrete, the weight would have produced a much deeper damage strip along the apparent slide path. If it is hollow then why are we seeing edge damage and little indication of penetration? It it is metallic, why is it not obvious? I think we can dismiss the idea that it was built on land when the sea level was lower. The build up of sediment is way too low. It is more in conformance with a recent event. Maybe it will turn out to be a huge fuel tank caught at sea and bombed though the curved walls appear to be effort beyond that. Right now we need some lab work done on those stones and soot at least. That way we may be able to wake up and discover a simple human explanation. The electrical problems suggests that a strong electrical field is been produced. This is easily tested. After that and provided the mystery deepens, then the next step will be to attach grab points onto the device and to actually lift it off the sea bed and bring it to dry dock. In the meantime I would like to see research done on WWII losses in the area. Did the Finns get up to something? Recall that a hollow concrete structure with bulk heads could make it out to sea before it sinks when a bomb hits it. If this were a simple building, there would be little interest while still failing to understand its locale. Surely we can demonstrate if it is concrete or not. Maybe the Finns pulled a large fuel tank out of harms way in order to get storage to a northern port. They certainly were up to it. Diver Peter Lindberg said: 'We have experienced things that I really couldn’t imagine and I have been the team's biggest skeptic regarding these different kind of theories. Member Dennis Åsberg said: 'I am one hundred percent convinced and confident that we have found something that is very, very, very unique. The quotes were first reported at NDTV. The Mail Online has reached out to the Ocean X team for clarification. 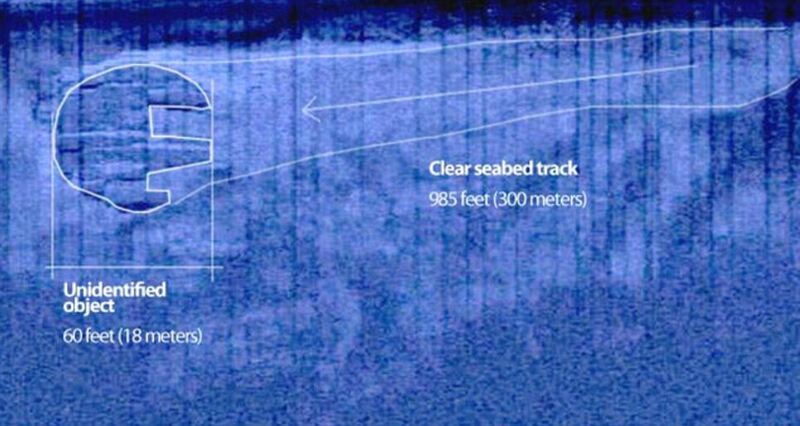 During their visit, the team saw a 985-foot trail that they described 'as a runway or a downhill path that is flattened at the seabed with the object at the end of it'. As it was before the recent dive, the story behind the object is anyone's guess, from a 'plug to the inner world' to the Millennium Falcon ship from Star Wars. In the past, such technology has confused foreign objects with unusual- but natural - rock formations. They're hoping for the former, and history seems to be in their favour. The Baltic Sea is a treasure trove for shipwreck hunters, as an estimated 100,000 objects are thought to line the cold sea's floor. A further dive will take place in the coming weeks. The unimagined release of tight oil into the global economy ends permanently the era of producer dominance. North America is first out the gate and will dominate the market simply because their governments take so small a share. Even at present consumption rates North America will now easily be come totally self sufficient. That is why we are turning pipelines around. This also means that the US balance of payments will quickly reverse its long time deficit. Thus the USA economy can be expected to become a perceived powerhouse once again. The housing and credit collapse is been corrected the hard way, but this reversal in the oil industry will go a long way to doing what the government shirked. 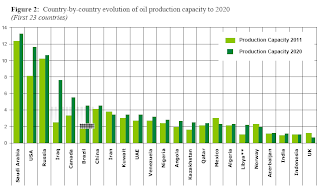 Oil: The Next Revolution, The Unprecedented Upsurge of Oil Production Capacity and What it means for the World. (86 pages) The figure is an all oil liquids prediction (which includes crude oil, natural gas liquids, biofuels etc...). The natural endowment of the initial American shale play, Bakken/Three Forks (a tight oil formation) in North Dakota and Montana, could become a big Persian Gulf producing country within the United States. But the country has more than twenty big shale oil formations, especially the Eagle Ford Shale, where the recent boom is revealing a hydrocarbon endowment comparable to that of the Bakken Shale. Most of U.S. shale and tight oil are profitable at a price of oil (WTI) ranging from $50 to $65 per barrel, thus making them sufficiently resilient to a significant downturn of oil prices. The combined additional, unrestricted liquid production from the aggregate shale/tight oil formations examined in this paper could reach 6.6 mbd by 2020, in addition to another 1 mbd of new conventional production. However, there remain obstacles that could significantly reduce the U.S. shale output: among them, the inadequate U.S. oil transportation system, the country’s refining structure, the amount of associated natural gas produced with shale oil, and environmental doubts about hydraulic fracturing, one of the key technologies for extracting oil from shale. After considering risk factors and the depletion of currently producing oilfields, the U.S. could see its production capacity increase by 3.5 mbd. Thus, the U.S. could produce 11.6 mbd of crude oil and NGLs by 2020, making the country the second largest oil producer in the world after Saudi Arabia. Adding biofuels to this figure, the overall U.S. liquid capacity could exceed 13 mbd, representing about 65 percent of its current consumption. The analysis in this paper is subject to a significant margin of error, depending on several circumstances that extend beyond the risks in each project or country. In particular, a new worldwide recession, a drastic retraction of the Chinese economy, or a sudden resolution of the major political tensions affecting a big oil producer could trigger a major downturn or even a collapse of the price of oil, i.e. a fall of oil prices below $70 per barrel (Brent crude). A hypothetical oil price downturn would have a significant impact, albeit short-lived, if it occurred before most of the projects considered in this paper had advanced significantly - that is, before 2015. 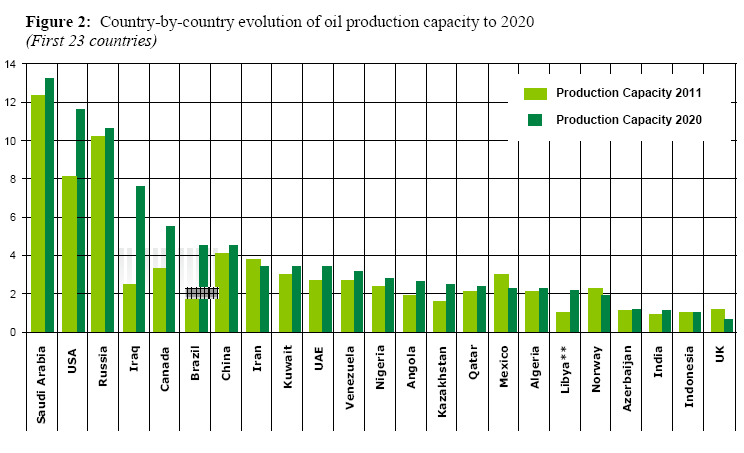 Conversely, if an oil price collapse were to occur after 2015, a prolonged phase of overproduction could take place, because production capacity would have already expanded and production costs would have decreased as expected, unless oil demand were to grow at a sustained yearly rate of at least 1.6 percent for the entire decade. The opposite could also happen. A sudden rebound of the world economy could strain the equilibrium of oil demand and supply, particularly if accompanied by geopolitical tensions. A new world-wide economic recession, a drastic change in Chinese consumption patterns, or a sudden solution to major political tensions affecting a major oil producer (such as Iran), could trigger a major decrease and even a collapse of the price of oil. By collapse, I mean a fall below $50 per barrel for one year. The problem with pottery is that early archeology found mountains of the stuff associated with settled living and made the natural assumption that this was when it was all invented. It made way more sense that hunters would soon learn to work with clay and would find some way to exploit it. Even using clay to line a basket and simply allowing it to cure could provide a small vessel able to hold water. Hot stones would then do the heating and the clay itself would never exceed boiling temperatures. This sample fits that minimalist model. Of course, all peoples were transitory on the landscape and we simply do not get meaningful middens unless it is at the sea shore. Unfortunately, all those were inundated 13,000 years ago anyway and such as we now have are recent. Besides, humanity and its predecessors have been using fire for a million years and a water tight container is critical in such cooking if only because much game meat must be cooked for two hours in a stew pot to ease consumption. That is why we lost our powerful jaws. 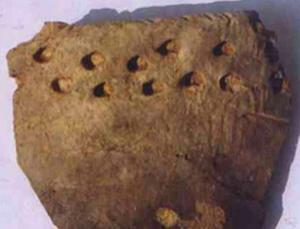 What was new during the agricultural expansion was fired clay. That took substantial manpower organization in order to produce the charcoal supply. And of course, fired clay will not breakdown so easily either. Thus the mountains of shards. Did a deep freeze spur our ancestors to get cooking? The discovery that the oldest pots in the world were made in China around the time of the Last Glacial Maximum suggests that might be the case. Ofer Bar-Yosef of Harvard University and colleagues excavated the cave again in 2009 and, for the first time, used radiocarbon dating to work out the age of the layers where the pottery shards were found. The oldest ones turned out to be between 19,000 and 20,000 years old. That is thousands of years before people began farming some 12,000 years ago – suggesting that the pots were made by hunter-gatherers, which is contrary to previous thinking. "The making of pottery is not necessarily related to agriculture," says Bar-Yosef. Bar-Yosef thinks the shards are the remains of crude pots and bowls, probably about 20 centimetres across. "They were poorly fired and easily breakable," he says. Their outer surfaces carry scorch marks and small amounts of soot, so Bar-Yosef thinks they were used for cooking. His dating data helps to locate the oldest potters, but humans had been manipulating clay into figurines for many years by then. The Venus of Dolní Věstonice, a small statuette of a naked woman found in what is now the Czech Republic is estimated to be about 30,000 years old. What prompted Chinese hunter-gatherers to start cooking food 20,000 years ago? Bar-Yosef points out that, at the time, Earth was in the clutches of the Last Glacial Maximum, the height of the last ice age. The extreme cold would have caused food shortages. Cooked food yields more energy than raw food, so throwing their meals on the fire could have helped people to survive. It takes some form of stress for species to undergo major changes, says Bar-Yosef. A later cold period, the Younger Dryas starting about 12,800 years ago, could have forced people to start farming (Current Anthropology, DOI: 10.1086/659784). Because much of Eurasia was colonised by then, people couldn't escape food shortages by moving to a new area. The only option was to start growing crops. Every once in a while, one wonders if we really seeing what we think we are seeing. One yearns for surety in a single fact out there. That blue arc is associated with the apparent super cluster and is surely integral to that super cluster and is not likely back lit at all. We need to think a little more deeply on just what we may be observing here. Otherwise you are asking for a stunning coincidence whose probability appears to require the age of the universe and much more. It is plausible that the super cluster is significant enough that the internal metric is dominant as compared to the metric of our universe and this produces an effective aura. The arc may actually be successfully thought of as the aura of the gravitational lens itself. Astronomers have spotted one of the rarest and most extreme galaxy clusters in the universe and, behind it, an object that shouldn’t exist. Galaxy clusters are collections of galaxies that orbit one another and are the most massive objects in the universe. The newly discovered cluster, first detected by the Hubble space telescope, is over 500 trillion times the mass of the sun. It is located approximately 10 billion light-years away. Because looking out into the distant cosmos means also looking back in time, the cluster formed during an era when the universe was a quarter its present age. The cluster, named IDCS J1426.5+3508, is extreme because during this period in cosmic history, massive collections of galaxies were just beginning to form. Only one other cluster of comparable size has been seen at this distance and it is a lightweight compared to IDCS J1426.5+3508. Adding to the object’s strangeness, a mysterious arc of blue light was seen just behind the galaxy cluster. 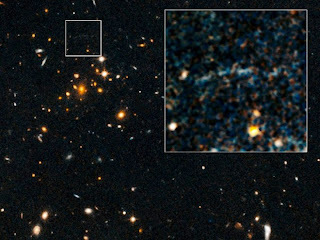 Astronomers think this indicates another massive star-forming galaxy located even further away at an even earlier epoch. 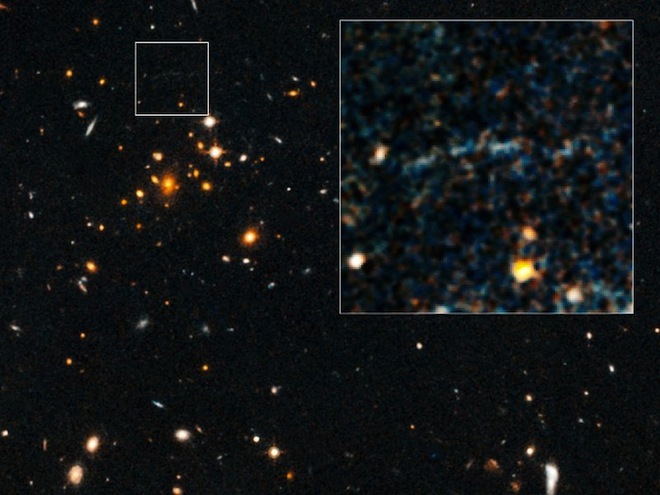 Light from this more distant — and yet unnamed – galaxy has been highly distorted by an effect known as gravitational lensing. The gargantuan mass of the galaxy cluster bends and twists light coming from the distant galaxy, creating the strange blue arc. The farther galaxy is estimated to be 10 to 13 billion light-years away and have a mass approximately 70 trillion times the sun. The astronomers who spotted the blue arc calculated that the odds of finding such a massive galaxy so distant in the universe are practically nil: “For the observed magnitudes we expect to find no arcs over the entire sky as bright,” the team writes in one of three papers outlining their findings, published online in The Astrophysical Journal June 26. Understanding how these objects came to be could help astronomers determine the history of galactic evolution throughout the history of the universe. The team hopes that the eROSITA mission – an x-ray telescope scheduled to launch next year and study galaxy clusters and dark matter – will provide more information on this bizarre finding. This appears to do it. The protocol been contemplated can also be used to vaccinate children to block nicotine addiction. What happens is that the capacity is inserted into the appropriate liver cells to churn out antibodies that go looking for nicotine. This intercepts the problem before it gets to the brain. I suspect it is not a magic bullet for the addicted as there is also the problem of managing the slow withdrawal of the chemical dependency itself. However it is certainly the natural partner for a withdrawal program. It also assures us that we can anticipate a hundred percent success rate simply because it will become progressively harder to ingest nicotine in a meaningful manner. Newswise — NEW YORK (June 27, 2012) -- Researchers at Weill Cornell Medical College have developed and successfully tested in mice an innovative vaccine to treat nicotine addiction. In the journal Science Translational Medicine, the scientists describe how a single dose of their novel vaccine protects mice, over their lifetime, against nicotine addiction. The vaccine is designed to use the animal's liver as a factory to continuously produce antibodies that gobble up nicotine the moment it enters the bloodstream, preventing the chemical from reaching the brain and even the heart. "As far as we can see, the best way to treat chronic nicotine addiction from smoking is to have these Pacman-like antibodies on patrol, clearing the blood as needed before nicotine can have any biological effect," says the study's lead investigator, Dr. Ronald G. Crystal, chairman and professor of Genetic Medicine at Weill Cornell Medical College. "Our vaccine allows the body to make its own monoclonal antibodies against nicotine, and in that way, develop a workable immunity," Dr. Crystal says. "While we have only tested mice to date, we are very hopeful that this kind of vaccine strategy can finally help the millions of smokers who have tried to stop, exhausting all the methods on the market today, but find their nicotine addiction to be strong enough to overcome these current approaches," he says. Studies show that between 70 and 80 percent of smokers who try to quit light up again within six months, Dr. Crystal adds. About 20 percent of adult Americans smoke, and while it is the 4,000 chemicals within the burning cigarette that causes the health problems associated with smoking -- diseases that lead to one out of every five deaths in the U.S. -- it is the nicotine within the tobacco that keeps the smoker hooked. There are, in general, two kinds of vaccines. One is an active vaccine, like those used to protect humans against polio, the mumps, and so on. This kind of vaccine presents a bit of the foreign substance (a piece of virus, for example) to the immune system, which "sees" it and activates a lifetime immune response against the intruder. Since nicotine is a small molecule, it is not recognized by the immune system and cannot be built into an active vaccine. The Weill Cornell research team developed a new, third kind -- a genetic vaccine -- that they initially tested in mice to treat certain eye diseases and tumor types. The team's new nicotine vaccine is based on this model. The researchers took the genetic sequence of an engineered nicotine antibody, created by co-author Dr. Jim D. Janda, of The Scripps Research Institute, and put it into an adeno-associated virus (AAV), a virus engineered to not be harmful. 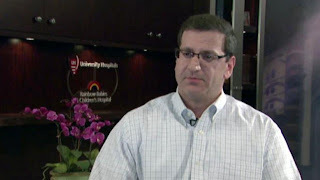 They also included information that directed the vaccine to go to hepatocytes, which are liver cells. The antibody's genetic sequence then inserts itself into the nucleus of hepatocytes, and these cells start to churn out a steady stream of the antibodies, along with all the other molecules they make. In mice studies, the vaccine produced high levels of the antibody continuously, which the researchers measured in the blood. They also discovered that little of the nicotine they administered to these mice reached the brain. Researchers tested activity of the experimental mice, treated with both a vaccine and nicotine, and saw that it was not altered; infrared beams in the animals' cages showed they were just as active as before the vaccine was delivered. In contrast, mice that received nicotine and not treated with the vaccine basically "chilled out" -- they relaxed and their blood pressure and heart activity were lowered -- signs that the nicotine had reached the brain and cardiovascular system. The researchers are preparing to test the novel nicotine vaccine in rats and then in primates -- steps needed before it can be tested ultimately in humans. Dr. Crystal says that, if successful, such a vaccine would best be used in smokers who are committed to quitting. "They will know if they start smoking again, they will receive no pleasure from it due to the nicotine vaccine, and that can help them kick the habit," he says. He adds that it might be possible, given the complete safety of the vaccine, to use it to preempt nicotine addiction in individuals who have never smoked, in the same way that vaccines are used now to prevent a number of disease-producing infections. "Just as parents decide to give their children an HPV vaccine, they might decide to use a nicotine vaccine. 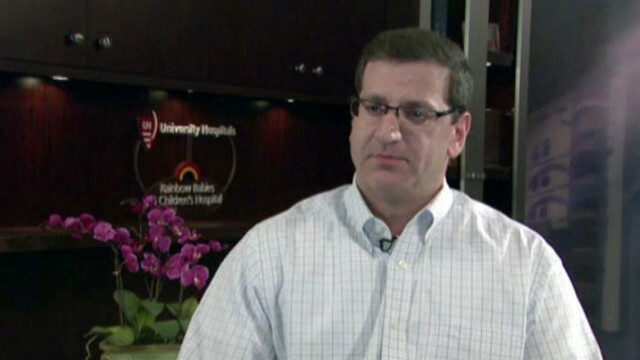 But that is only theoretically an option at this point," Dr. Crystal says. "We would of course have to weight benefit versus risk, and it would take years of studies to establish such a threshold." "Smoking affects a huge number of people worldwide, and there are many people who would like to quit, but need effective help," he says. "This novel vaccine may offer a much-needed solution." Other study co-authors are Dr. Martin J. Hicks, Dr. Jonathan B. Rosenberg, Dr. Bishnu P. De, Dr. Odelya Pagovich, Dr. Jian-ping Qiu, Dr. Stephen M. Kaminsky, Dr. Neil R. Hackett, and Dr. Stefan Worgall from Weill Cornell Medical College, and Dr. Colin N. Young and Dr. Robin L. Davisson from Cornell University. What is forming is a global consensus around thorium reactor development. I think that this is a milestone in terms of general credibility and ultimate introduction of the developing technology. This is extremely important. 1 not said here is that a working thorium salt reactor can be used to consume all spent nuclear fuel because it bathes the atoms in neutrons and speeds decay. Thus even if we no longer need nuclear power, we need thorium reactors to mop up the spent fuel. 2 They provide effectively bullet proof heat engines because of the natural fail safes. 3 The decay process itself ends in benign byproducts. Had we not been so excited about making bombs, thorium would have led the nuclear age for just these reasons. Now we need thorium to clean up the mess. China and India is also leading this initiative and that means we are the beneficiaries rather than the other way around. Get over it and say thankyou. DOE is quietly collaborating with China on an alternative nuclear power design known as a molten salt reactor that could run on thorium fuel. China plans to have a 5 megawatt molten salt reactor in 2015. Outside of the DOE, at least three companies in the West are privately developing thorium reactors: Flibe Energy, Huntsville, Ala, which has dusted off 1960s ORNL technology; Thorenco, San Francisco; and Ottawa Valley Research, Ottawa. Baroness Bryony Worthington of the UK House of Lords has emerged as the West’s political champion for thorium. India, home to huge reserves of thorium, also has ambitious plans. Japanese utility Chubu Electric is considering it. 2. India Atomic Energy Commission (AEC) chairman R K Sinha said - India is planning to establish a nuclear power plant that uses thorium as main fuel instead of uranium, which is used in conventional reactors. Sinha said the country already has the technological know-how to use thorium. However, for large-scale use of thorium, the country will need two decades. "We have to assess the thorium-powered reactor on various aspects in the long-term before replicating similar models in bigger ways," he added. The U.S. Department of Energy is quietly collaborating with China on an alternative nuclear power design known as a molten salt reactor that could run on thorium fuel rather than on more hazardous uranium, SmartPlanet understands. As SmartPlanet reported late last year, Jiang - the son of former Chinese leader Jiang Zemin - led a Chinese delegation visiting DOE’s Oak Ridge National Laboratory to discuss ORNL’s thorium molten salt reactor (MSR) technology. Some sources identify him as a vice president of CAS. ORNL developed a thorium MSR in the 1960s. The 48-page presentation, entitled “TMSR Project of CAS” (TMSR stands for thorium molten salt reactor) is dated March 12, 2012 throughout, except on the cover page, which gives a March 18 date. It names the author as Xiaohan Yu from CAS’ TMSR Research Center, based at the Shanghai Institute of Applied Physics. The abbreviation “UCB” also appears on the cover page, suggesting that Yu (I believe his Chinese name is Yu Xiaohan, Americanized to Xiaohan Yu in the presentation) delivered his talk at the University of California Berkeley on the 18th. One of the scientists working in the alliance is John Arnold, a UC Berkeley chemistry professor. I’ve sent emails over the last day to Lyons, Jiang, Arnold and several other principles, requesting confirmation and elaboration. No additional information came back by publication time. Proponents of thorium MSRs, also known as liquid thorium reactors or sometimes as liquid fluoride thorium reactors (LFTRs), say the devices beat conventional solid fuel uranium reactors in all aspects including safety, efficiency, waste and peaceful implications. 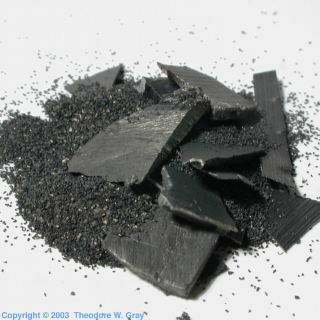 Among the claimed benefits: thorium waste cannot be easily shaped into a bomb; the waste lasts only hundreds of years rather than tens of thousands for uranium; thorium in liquid form burns more efficiently than solid uranium; liquid thorium reactors do not operate at dangerous high pressure; liquid thorium reactors cannot melt down. The U.S. under President Richard Nixon chose uranium over thorium in part because uranium reactors provided the weapons grade waste that was desirable during the Cold War. That set the stage for a uranium-based nuclear industry. Today, solid uranium fuel powers almost all of the world’s 434 commercial reactors. One reason for China’s interest in thorium: It has an ample supply of the substance, which occurs in monazite, a mineral that also contains rare earths, the metals that are vital across industries ranging from missiles to wind turbines to iPods. China, which dominates the world’s rare earth market, is believed to be sitting on substantial stockpiles of thorium that it has already extracted from the rare earths that it has mined and processed. The CAS presentation also points out that China has far more thorium than uranium. It notes that China imported 95 percent of the uranium ore it used in 2010. To address its uranium shortfall, China has been buying up foreign uranium mines, including taking control of Namibia’s Husab mine in March. Nuclear currently provides less than 2 percent of China’s electricity. But as SmartPlanet has noted,its share will surge as China builds as many as 100 new reactors - nearly a quarter of the world’s current total - over the next 20 years. Those will include conventional uranium reactors as well as alternative designs such as thorium MSRs and fast neutron reactors. (Bill Gates’ TerraPower is developing a type of FNR known as a traveling wave reactor. Gates has also discussed a possible Chinese co-operation, with China National Nuclear Corp). FNRs are expected to play a big role in China by 2050. China is developing at least two thorium reactors, and is looking at molten salt technology as well as at another approach that triggers a thorium reaction by using a particle accelerator - a technique pioneered by Nobel Prize winning physicist and former CERN director Carlo Rubbia. Scientists from ORNL, MIT, the University of California Berkeley, Idaho National Laboratory (INL) and several branches of CAS including the Shanghai Institute of Applied Physics (SINAP) and Shanghai Advanced Research Institute are on the MOU committee (again, see chart below). Two of the U.S. labs - ORNL and INL - are co-managed for DOE by Battelle Memorial Institute, the Columbus, Ohio non-profit science and technology group. What’s not clear is what, exactly, the U.S. will get from the collaboration. While China has declared an interest in building thorium reactors - including CAS’ January 2011 approval of a TMSR project - the U.S. has not. The partnership with China suggests that the U.S. acknowledges a possible role for thorium in its energy future. But some skeptics worry that the U.S. is foolishly abetting Chinese efforts to advance a crucial energy technology that China could soon control, and thus give China hegemony in two vital areas: rare earths and energy. ORNL, the 1960s thorium molten salt pioneer, has no clear path to commercialization given the U.S. government’s lack of commitment to the technology. Outside of the DOE, at least three companies in the West are privately developing thorium reactors: Flibe Energy, Huntsville, Ala, which has dusted off 1960s ORNL technology; Thorenco, San Francisco; and Ottawa Valley Research, Ottawa. Baroness Bryony Worthington of the UK House of Lordshas emerged as the West’s political champion for thorium. India, home to huge reserves of thorium, also has ambitious plans. Japanese utility Chubu Electric is considering it. And thorium is picking up attention with the recent publication of the book SuperFuel, by author Richard Martin. Many of those supporters urge the use of thorium reactors not only for generating electricity, but also for providing carbon-free heat to power industrial processes such as extracting oil from tar sands, or in the metals, chemicals and cement sectors, among others. They also point out that the reactors could power water desalination, and that they have valuable byproducts that could be used as fertilizers and for medical applications. China clearly sees many of those benefits as well. The CAS presentation describes the possible use of thorium reactors as a heat source for various applications, including hydrogen and methanol production. CAS also points out that molten salt, germane to liquid thorium reactors, can also serve as heat storage in solar thermal power plants in which parabolic mirror warm a fluid that eventually drives a turbine. By storing the fluid’s heat, molten salt technology can potentially answer one of the main criticisms of solar power: that it cannot generate electricity at night. Like thorium nuclear, that would be a development that should equally interest either country. Let’s see if technology truly flows in both directions in this new partnership. This is an oddity and provides excellent insight into the culture of the late fifth century. Of course we do have ample Roman sources to help understand the milieu. Again it is noteworthy that this high status person is a women which conforms to our knowledge of local traditions of northern Europe and even the Mediterranean. The burial of a cow is so far unique which jumps this dig to the top of the list. In the meantime it tells of a surprisingly rich culture that was certainly anchored around animal husbandry. 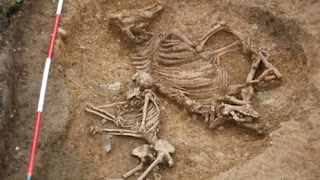 Archaeologists described the find as "unique in Europe"
The grave was uncovered in Oakington by students from Manchester Metropolitan University and the University of Central Lancashire. At first it was thought the animal skeleton was a horse. Student Jake Nuttall said: "Male warriors might be buried with horses, but a woman and a cow is new to us." He added: "We were excited when we thought we had a horse, but realising it was a cow made it even more bizarre." Co-director of the excavation, Dr Duncan Sayer, from the University of Central Lancashire, said: "Animal burials are extremely rare, anyway. "There are only 31 horse burials in Britain and they are all with men. "This is the first animal to be discovered with a woman from this period - the late 5th Century - and it's really interesting that it's a cow, a symbol of economic and domestic wealth and power. "It's also incredibly early to find any grave of a woman buried with such obvious wealth." The skeleton was found with grave goods including brooches and hundreds of amber and decorated glass beads. "She also had a complete chatelaine [keychain] set, which is an iron girdle and a symbol of her high status," Dr Sayer said. "It indicates she had access to the community's wealth. "She is almost certainly a regional elite - a matriarchal figure buried with the objects that describe her identity to the people who attended her funeral." Joint director Dr Faye Simpson, from Manchester Metropolitan, said: "A cow is a big thing to give up. "It's a source of food and something that would have been very expensive to keep, so to sacrifice it would be a big decision. "They would have wanted to give her something really important to show respect and they wouldn't have done that for just anybody. "That's why we don't find cows with burials," she said. 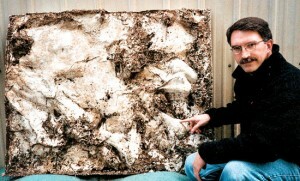 Dr Sayer added: "The cow burial is unique in Europe which makes this an incredibly exciting and important find. "I don't think I'll find anything as significant as this again in my lifetime." Some extraordinary lab work on the Red Rain phenomena that is completely reproducible. It is time to wake up. First, we need to deliberately sample rainfall in selected locates and to discover anomalies. Knowing that they are possibly there is a good start. Several other comparables are mentioned. Secondly, the replication experiment is mind bending and needs to be intensified. Right now we are missing DNA. Why? maybe we are not. The material may have come from space or it may have come from Earth or it may also have been resident in the stratosphere where I have already suggested we may discover balloon like slime molds. Thinking we may have already found it if it were resident in the stratosphere is needlessly optimistic and a thunderhead is the type of disturbance to drain material out of that environ or close enough anyway. Right now we do not even know what we do not know because we have not seriously searched the upper atmosphere thinking we had no need to do so. At the moment it appears we are looking at a life form that different from earth life but looks like life. We have waited long enough on this to resolve it clearly and claims of local algae are merely convenient when you have samples to test. The 'Red Rain' Mystery: Showers of Alien Life? From July 25 through September 23, 2001, red rain sporadically fell on the southern Indian state of Kerala. Heavy downpours occurred in which the rain was coloured red, staining clothes with an appearance similar to that of blood. Yellow, green, and black rain was also reported. Colored rain had been reported in Kerala in as early as 1896 and several times since then. It was initially announced that the rains were coloured by fallout from a hypothetical meteor burst, but a study commissioned by the Government of India found that the rains had been coloured by airborne spores from a locally prolific terrestrial alga. Other explanations were proposed but not until early 2006 did the colored rains of Kerala gain widespread attention in the popular media. 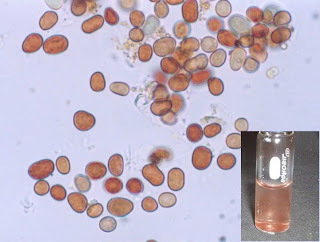 A controversial conjecture that the colored particles were extraterrestrial cells was proposed by Godfrey Louis and Santhosh Kumar of the Mahatma Gandhi University in Kottayam. For years, claims circulated that red rain which fell in India in 2001, contained cells unlike any found on Earth. Newer evidence that these cells can reproduce was published by MIT in the Technology Review. For example, various bugs have been shown to survive for months or even years in the harsh conditions of space. And one of the more interesting but lesser known facts about the Mars meteorite that some scientists believe holds evidence of life on Mars, is that its interior never rose above 50 degrees centigrade, despite being blasted from the Martian surface by an meteor impact and surviving a fiery a descent through Earth's thick atmosphere. If there is life up there, this evidence suggests that it could survive the trip to Earth. All that seems well established. Now for the really controversial stuff. In 2001, numerous people observed red rain falling over Kerala in the southern tip of India during a two month period. One of them was Godfrey Louis, a physicist at nearby Cochin University ofScience and Technology. Intrigued by this phenomena, Louis collected numerous samples of red rain, determined to find out what was causing the contamination, perhaps sand or dust from some distant desert. Under a microscope, however, he found no evidence of sand or dust. Instead, the rain water was filled with red cells that look remarkably like conventional bugs on Earth. What was strange was that Louis found no evidence of DNA in these cells which would rule out most kinds of known biological cells (red blood cells are one possibility but ought to be destroyed quickly by rain water). Louis published his results in the peer-reviewed journal Astrophysics and Space in 2006, along with the tentative suggestion that the cells could be extraterrestrial, perhaps from a comet that had disintegrated in the upper atmosphere and then seeded clouds as the cells floated down to Earth. In fact, Louis says there were reports in the region of a sonic boom-type noise at the time, which could have been caused by the disintegration of an object in the upper atmosphere. Since then, Louis has continued to study the cells with an international team including Chandra Wickramasinghe from the University of Cardiff in the UK and one of the leading proponents of the panspermia theory, which he developed in the latter half of the 20th century with the remarkable physicist Fred Hoyle. Louis, Wickramasinghe and others published some extraordinary claims about these red cells. They say that the cells clearly reproduce at a temperature of 121 degrees C. "Under these conditions daughter cells appear within the original mother cells and the number of cells in the samples increases with length of exposure to 121 degrees C," they say. By contrast, the cells are inert at room temperature. That makes them highly unusual, to say the least. The spores of some extremophiles can survive these kinds of temperatures and then reproduce at lower temperatures but nothing behaves like this at these temperatures, as far as we know. This is an extraordinary claim that will need to be independently verified before it will be more broadly accepted. And of course, this behaviour does not suggest an extraterrestrial origin for these cells, by any means. However, Wickramasinghe and company can't resist hinting at such an exotic explanation. They've examined the way these fluoresce when bombarded with light and say it is remarkably similar to various unexplained emission spectra seen in various parts of the galaxy. One such place is the Red Rectangle, a cloud of dust and gas around a young star in the Monocerous constellation. It would be fair to say that more evidence will be required before Kerala's red rain can be satisfactorily explained. In the meantime, it looks a fascinating mystery. Wickramasinghe and Hoyle have also used their data to argue in favor of intelligent design, and propose that the first life on Earth began in space, spreading through the universe via Panspermia, and that evolution on earth is influenced by a steady influx of viruses arriving via comets. "Once again the Universe gives the appearance of being biologically constructed, and on this occasion on a truly vast scale. Once again those who consider such thoughts to be too outlandish to be taken seriously will continue to do so. While we ourselves shall continue to take the view that those who believe they can match the complexities of the Universe by simple experiments in their laboratories will continue to be disappointed." What I have always found extraordinary is the stunning inability of skilled scientists to come to grips with new data, although the Sasquatch is hardly new data. This item shows us just how hard it is. It is almost as if the man were brainwashed since childhood. I suspect we are dealing with the phenomena of extraordinary memory that finds it difficult to use logic to overcome the emotional content of the remembered position. Once this is set up, the memory is not easily lost because so much has been invested in that memory. Thus when confronted with a clear casting that you or I could not properly interpret ourselves nor expect anyone to fake anyway, the trained observer sees exactly what is there and understands what he is looking at. That casting just went up massively in my world as outright confirmation of the Sasquatch. Sooner or later, the heavy money will be spent to film this creature at night and to even track specimens and more appropriately to establish actual contact. A bushel of apples would be my first choice and plenty of cameras able to no night work. The present efforts smacks terribly of amateurism when real large game trackers do exist who know how to be as cunning a the quarry. Recall that no wolverine ever gets trapped twice and after the first encounter, he will make it his business to work your trap line until he drives you out of his country. You will never see him either. Wash. — It’s easy not to believe in Bigfoot. It’s harder to accept the possibility, and harder still to go public with that acceptance. Fingerprint expert Jimmy Chilcutt says he has “had that used against me, or tried to use against me, in court.” Members of the jury, how seriously can you take the testimony of a man who who believes in THAT? Meldrum’s promotion was approved, but he, Chilcutt and others researching the Sasquatch phenomenon remain frustrated by those peers who remain unwilling even to consider their findings. “It’s baffling that academics, who one would think would be objective and open-minded to questions on the fringes of knowledge,” Meldrum said, “would instead not be fair-minded and egalitarian in the treatment of their colleagues that delve into that realm to explore where the evidence will lead. A number renowned scientists — notably George Schaller, one of the world’s preeminent naturalists, and primatologist Jane Goodall, known for her chimpanzee research — have publicly called for more a open-minded approach by science to the research of Meldrum and others. But perhaps no scientist has undergone a more dramatic transformation in terms of that open-mindedness than Daris Swindler. A long-time professor of anthropology at the University of Washington, Swindler quite literally wrote the book on the comparative anatomy of man, apes and chimpanzees. His masterwork, “An Atlas of Primate Gross Anatomy,” is considered mandatory reading for all primate anatomists. And for many years, Swindler was publicly adamant that Sasquatch did not and could not exist. In September 2000, though, a group of researchers took a 31/2-by-5 foot cast of what appeared to be a partial body print of a large animal reclining in the mud in a Skamania County area of the Gifford Pinchot National Forest called Skookum Meadow. “He looked at that cast and saw the very same thing I did,” recalls Meldrum. “His attention immediately was drawn to this remarkable Achilles tendon and very broad heel imprint, and what we interpreted to be the prominent buttock. For Swindler, though, that realization was profoundly affecting — something that became obvious to the documentary film’s producer, Doug Hajicek, when he went to Swindler’s suite to find out what his on-camera testimony would be. Hajicek said Swindler had calculated, based on the size and structure of the creature’s leg and well-defined Achilles tendon, that the weight of the animal had to have been between 600 and 800 pounds. And that, as Meldrum said, the animal had to have been bipedal — that is, moving around primarily on two legs. The take home is that the technology works, but will now need progressive development likely lasting years and perhaps decades, although we already have effective deliverables. Complex cell structures will surely take plenty of time to master yet be solvable. It is obvious though that this biotechnology and that is what it is, will displace all restoration tasks in medicine and can partially do that today. Thus biological replacement will be common with at most the embedding of carbon fiber to strengthen bone, such as in the skull and teeth. We all could use teeth enamel with the strength of diamond. This development along with the restoration of aged cells is our medical future. One of these advances was Swedish scientists' creation of a custom veinthat has carried blood from a little girl's intestines to her liver for a year and counting. In another, a group in Japan successfully implanted lab-grown livers made from human cells into mice -- organs that metabolized drugs the way they would in a human.